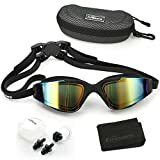 Noorlee Swim Goggles have the stylish appearance and provide you crystal clear vision because of the Latest Electroplating Technique and the advanced mirrored coating for the lenses. With the stretchy adjustable straps and quick-fit buttons, our swimming goggles are easy to use and can be worn by swimmers of all ages. Made from soft and hypoallergenic silicone, the goggles provide extreme comfort during use, never leave a mark on your nose or face. Summer is coming, you and your family will enjoy swimming and stand out of the crowd with Our stylish and functional Swim Goggles! 1. Open the straps by using the quick release buckle. 2. Press the goggles to your eyes to create comfortable seal. 3. Adjust the strap as needed using the buttons located on the clasp. 5. Avoid touching the insides of the lenses as this can damage the anti-fog coating. 6. Rinse in clean water after use, then air dry the swim goggles. 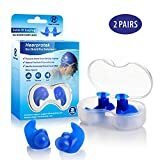 EXCELLENT MATCH – 2 Packs of High Quality Swim Goggles provide Ultimate Protection from Pool Water, Sunshine and Harmful Light, Perfect Fit for Women Men and Children – Protect Yourself & Your Family. CRYSTAL CLEAR VISION – Latest Electroplating Technique and High-tech Mirrored Coating for the lenses can filter out harmful rays and protect your eyes from direct sunlight, which provide you good visibility. Advanced UV protection and anti-fog coating can enhance your swimming experience. EASY TO USE – The strap is specially designed for easy adjustment between sizes. 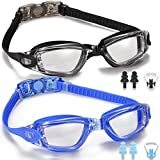 Also, with the quick release clasp on the back, you can put on the swim goggles in seconds without tangling your hair. HASSLE FREE 12 MONTHS GUARANTEE – If you have any question, please do not hesitate to contact us. We will offer you satisfactory solution within 24 hours, so you have no risk at trying our ‘Highly Recommended’ products and customer service.